In what has become an annual tradition for Qualcomm, the company has once again opened the doors of their San Diego headquarters to the press to take a preview look at the next generation of their flagship mobile platform. These events have been going on for several years now, and have become an integral part of how Qualcomm approaches the public with their wares; preview events not only let them set expectations, but to get the word out to technically-minded audiences in a vendor-neutral manner. Rather than being one part in the next flagship smartphone, preview day means that everything can be about Qualcomm and the platforms that they have created. 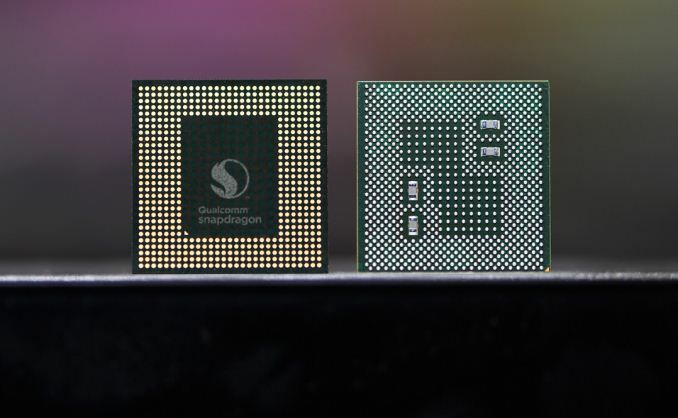 Late last year Qualcomm announced the Snapdragon 845 platform, the successor to 2017’s Snapdragon 835. Implementing a number of important architectural improvements over its predecessor, the Snapdragon 845 gets to follow-up on what ended up being a rather well-received platform in the Snapdragon 835, and to see if Qualcomm can maintain their momentum. Qualcomm used their December event to release a good bit of info on the 845 in advance, so we’ve already had a chance to see what Qualcomm is planning architecturally. And now with the preview event we finally get to see how all of this comes together with a look at the platform as a whole. Whenever discussing the state of affairs of Qualcomm’s flagship SoCs, I always struggle not to tie it to the Snapdragon 810 in some fashion. Which not to beat Qualcomm over the head for past mistakes – in that case a poorly thought out response to Apple – but rather because it serves as a such a great point of reference for discussing the company’s SoC development as a whole. 810 was arguably the company’s low point, so everything since then has been part of a rather remarkable upward trajectory for the flagship Snapdragon. Even though Qualcomm has been leading the pack in high performance SoCs for several years now, last year’s Snapdragon 835 in particular really felt like Qualcomm was in that position for all-around technical capabilities and not merely because of size, momentum, and the realities of LTE licensing. All of this means that there’s a lot riding on the Snapdragon 845, just in a different and less obvious way than before. Qualcomm has redeemed themselves from the 810 and it’s not a question of whether they can put together a great SoC, but instead it’s a question of how they will follow up upon a great SoC like the 835. The answer to that comes in the form of the Snapdragon 845, an interesting SoC that is a “tock” design if there ever was one. Qualcomm doesn’t get the advantage of an entirely new manufacturing node – the 845 is being made on Samsung’s second-generation 10LPP process, a refined version of 10LPE used for the 835 – so Qualcomm’s improvements are rooted almost entirely in architecture rather than a mix of architecture and manufacturing. Which is to say that it’s a bit of an uphill challenge for the company, but the flip side of that argument is that it’s going to be a chance for Qualcomm’s architectural engineers to take attention front and center. 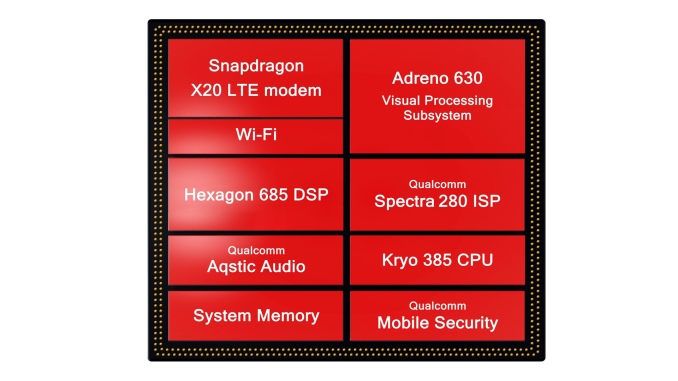 What the Snapdragon 845 entails then, as we originally learned late last year, is a series of upgrades and overhauls across all the various subsystems of the SoC. Arguably the biggest news here is that Qualcomm’s latest-generation Kyro 385-series CPU cores are derived from ARM’s Cortex-A75 and A55 designs, and that the resulting SoC is the first to employ ARM's DynamiQ CPU cluster organization. DynamIQ enables the various different CPU cores within an SoC to be hosted within the same cluster and cache hierarchy, as opposed to having separate discrete clusters with no shared cache between them, allowing for finer-grained and more efficient approaches to when and how various clusters are powered up. Meanwhile on the GPU side, the notoriously tight-lipped GPU group over at Qualcomm has confirmed that the Snapdragon 845 implements the first Adreno 600 series GPU, which in turn is the first new GPU architecture from Qualcomm in a couple of years and promises some significant performance improvements. Outside of the core processor architecture, the changes in the rest of the SoC are perhaps not quite as dramatic, but still important to the platform as a whole. This includes, of course, Qualcomm’s latest and greatest LTE modem, the Snapdragon X20, upgrading Qualcomm’s LTE capabilities category 18. Both the camera ISP and Hexagon DSP have also been upgraded as well with the introduction of the Spectra 280 and Hexagon 685, which Qualcomm will be leveraging for camera image quality improvements and their stake in the modern mobile AI race respectively. Finally, the SoC also includes the latest version of the company’s Aqstic audio codec, which although audio has not traditionally been heavily promoted by the company, will be an increasingly important part of differentiating itself from other high-performance mobile SoCs. Getting down to the heart of matters then, this year’s flagship Snapdragon platform preview is a lot like last year’s. We’re once again taking a look at a Qualcomm Reference Design (QRD), which is a fully functional smartphones in a slightly oversized, utilitarian chassis used for hardware testing and software development. 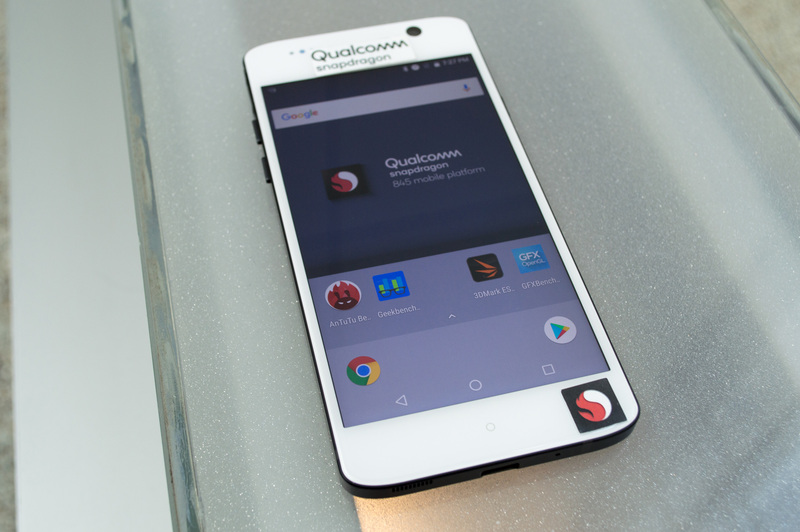 The Snapdragon 835 QRD was a 5.5-inch equivalent phone, and for the 845 QRD Qualcomm has stuck with much the same. The device itself is unremarkable, featuring a 1440p LCD and 6GB of LPDDR4X memory, but it’s otherwise typical of the class of Snapdragon 845 devices we expect to see starting a bit later this year. Similarly, while this is still a preview, final device performance shouldn’t be too much different from what we see with Qualcomm’s QRD. Vendors do make customizations to both hardware and software, so how a device’s cooling system is built or how aggressive the power management is configured will have an impact on final performance. But as far as stock performance goes, the QRD is about as neural as it gets, if not a slightly idealized case for the platform as it allows Qualcomm to optimally configure the phone themselves. "When we’re looking at competitor devices we see only the the iPhone X able to compete with the last generation Snapdragon 835 devices – however with a catch. The A11 is severely thermally constrained and is only able to achieve these scores when the devices are cold. Indeed as seen from the smaller score of the iPhone 8, the SoC isn’t able to sustain maximum performance for even one benchmark run before having to throttle." I was curious about that, as the iPhone X has a lower score on Futuremark's website. So the next gen Qualcomm chip gpu beats apples last gen tech. "So the next gen Qualcomm chip gpu beats apples last gen tech." The A11 isn't, in any way, superior to the SD835 for mobile. Get this through your heads people. Have you been under a rock? Haven't you been reading about the failures of Apple's core architecture? What else do you want as proof? REMAIN CALM!! ALL IS WELL!!!! !